+1 Entrepreneur Interviews celebrate Fort Wayne area entrepreneurs who deserve an upvote. 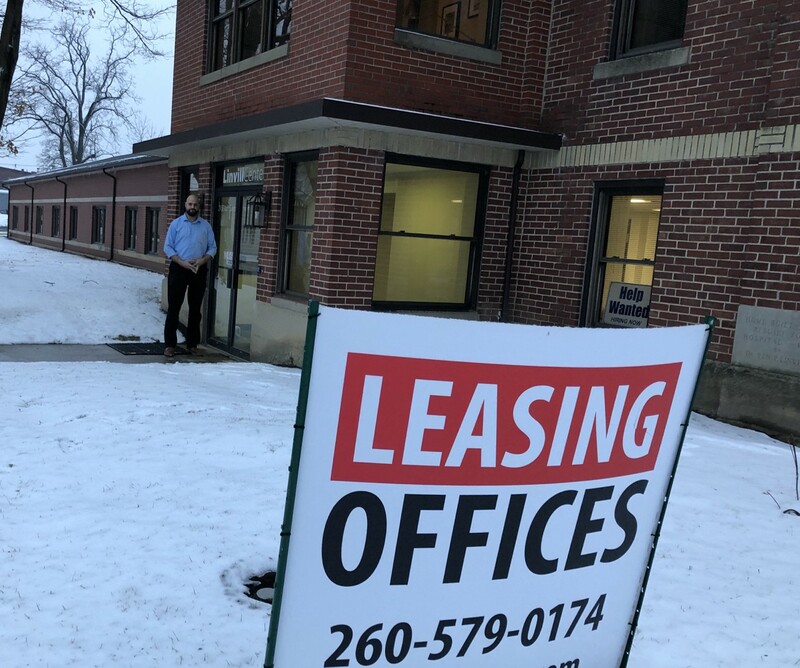 This post celebrates Nathan Miller of the Linvill Center, a restored historic building that now provides premium office suites in downtown Columbia City. In the 19th Century, a stunning mansion was built just a block from the Courthouse Square in Columbia City, IN. 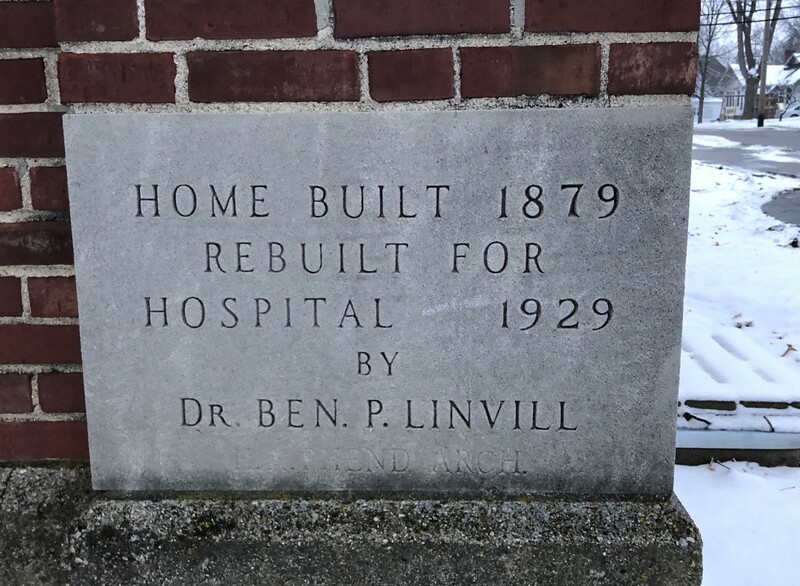 Originally a home, it later was rebuilt and reborn as Linvill Hospital. As it aged, it served as Columbia City Hospital and in the 1980’s was acquired by Parkview Health and became a therapy center. But eventually, it lost its sheen (hard to compete with the brand new Parkview Whitley Hospital opened in 2011). But this story is not about Ben Linvill — it’s about Nate Miller and how he and his family transformed Ben’s old property. When Nate and his family became aware of the property in 2015, it had been purchased by a new owner after having sat empty for a period of time. Rumor was that it had been purchased as part of a bundle and the owner was less interested in Linvill than the rest of the bundle. Nate and his family were able to acquire it. The family had renovated and flipped houses, but they had never tackled anything on this scale (a 15,000 square foot 19th Century commercial building). Being Millers, they just rolled up their sleeves and went to work. For work they couldn’t personally do, they found trusted contractors. While Nate’s family helped with renovation, Nate operates Linvill today. So, who is this Nate Miller? It’s tough [impossible] to put a box around Nate. At the time Linvill was acquired, he was the Planning and Zoning Director for Noble County. Sounds like a bureaucrat, right? Wrong. His background is really diverse. Studied theology in college. Acquired a degree in graphic arts. Co-started a wide-format print shop. Family man (after this interview he was headed to dinner with his extended family). Designed baby products. Loves marketing. Paints (fine art). Started a web design company and sold it. Did some work as a surveyor. 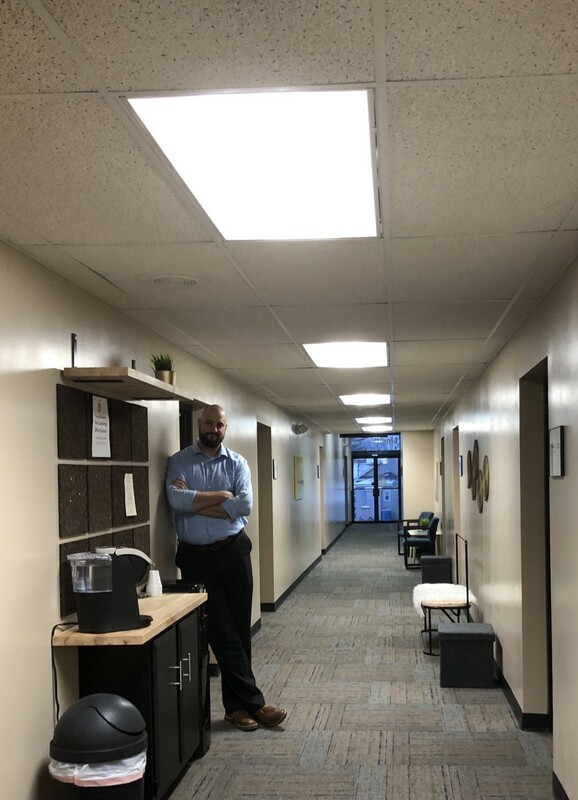 Today he has a day job with the Purdue Extension office where his department’s wide exploratory charter is to find ways to “build a world where it’s easier to live healthy.” And, don’t forget, operates the Linvill Center. I’m going to label Nate a renaissance man. In other words, the perfect person to guide a neglected building through its own renaissance. Job one after acquisition was renovation. Seriously. I visited the property back then shortly after it had been acquired. Let’s just say it was “a fixer upper”. 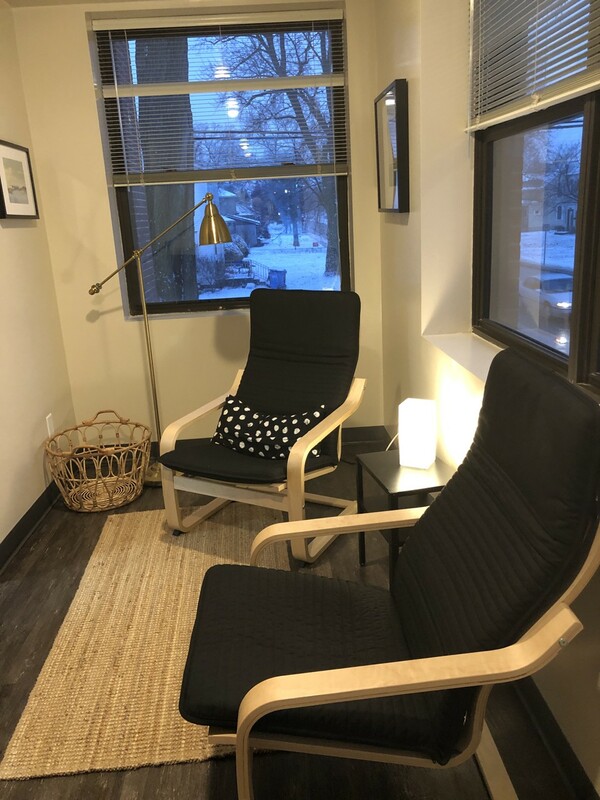 The idea was to renovate Linvill into “a place where small businesses can thrive and grow.” You would expect that the family would renovate the space and wait until it was finished to start leasing. But, it’s hard to separate the launch of the space from the renovation, because the two blurred together. Very quickly. On the very day after the Millers closed their acquisition of Linvill, Cameron Deckard from Carnivore Fitness [“Get Yelled At and Sweat!”] just walked in — and reserved an entire wing! Now, Carnivore has grown to be a thriving business in a beautifully built-out workout space [sorry, I didn’t take photos in order to protect the privacy of those working out when I visited]. Others, like INDOT, also came in during construction. Nate had assumed that Linvill would attract lots of 1 or 2 person little companies. 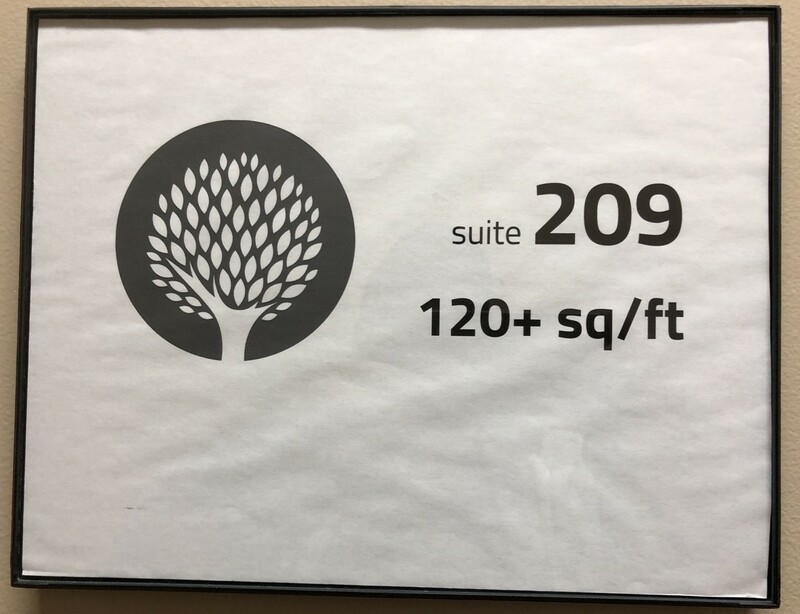 It turns out that the larger double offices all got leased first. One company, Bill Dittlinger’s Music Encounters quickly outgrew Linvill (before their lease was even up) and bought a building in Columbia City. Nate considers that a huge success! 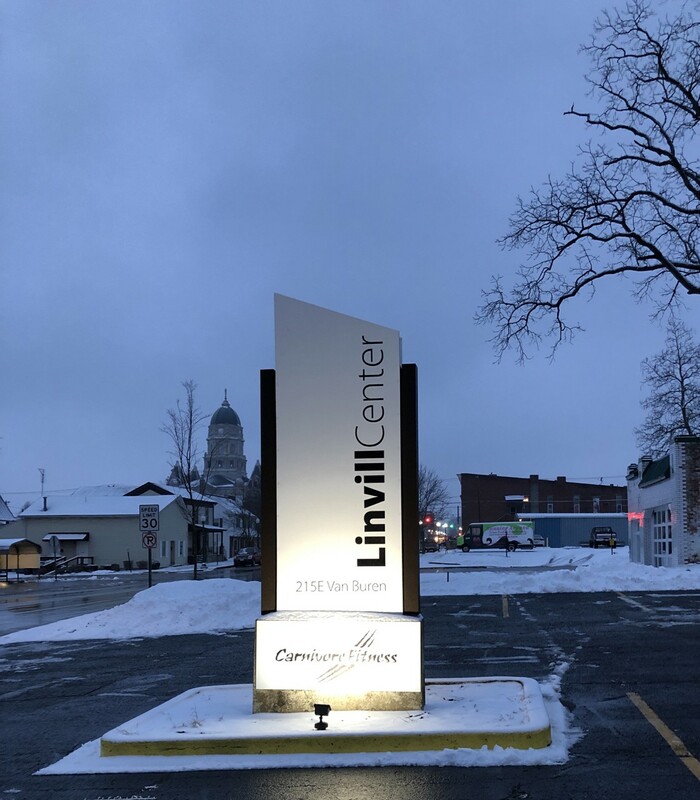 That was the goal for Linvill in the first place — “a place where small businesses can thrive and grow.” Music Encounters did exactly that! The fact that they outgrew Livill was a bonus! Today, the Linvill Center is beautiful. It is a comfortable, well designed, and well appointed place for businesses of various kinds and sizes. The near term future of Linvill is pretty predictable. With renovation complete, except perhaps for some minor remodels, increasing occupancy is the immediate goal. Linvill was designed for “collisions of small businesses”. Nate is working on occupancy, but his ultimate goal is not occupancy per se, but upping the effect that a critical mass of people can have on each other. 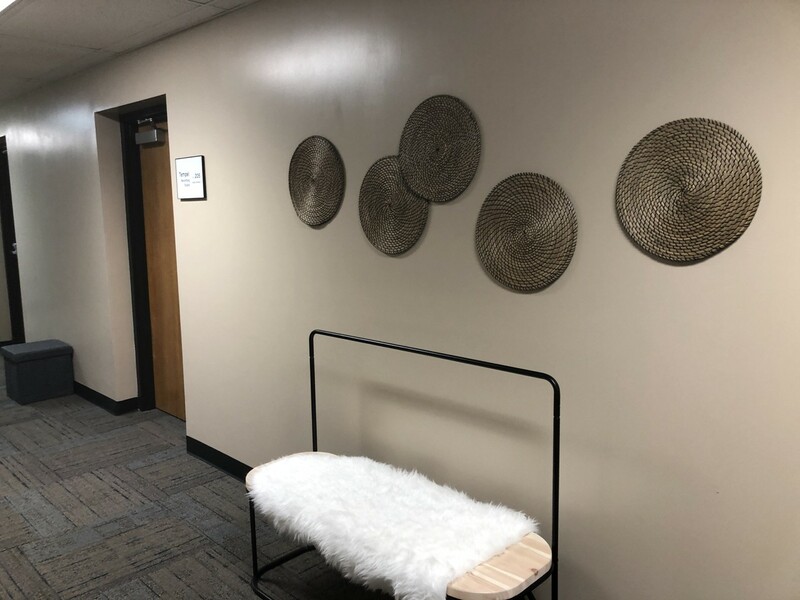 That place where businesses can “thrive and grow” is designed to benefit from the connections and creative collisions caused by more people mixing in Linvill’s hallways, doorways, and parking lot. The long term future is not at all predictable. Even Nate admits that “Who knows?” is the right answer. All I’d bet is that Nate will make it a new renaissance of some sort. Nate gives a nod to Fortezza Coffee. The connections, the staff, and the atmosphere all combine to create opportunity. I can attest that on most days you’ll find Nate at Fortezza at some point. He also cites Old Crown Coffee and Conjure Coffee (outside of which his Purdue friends conducted a livable neighborhood project) for the same reasons. He gives a shoutout to Trent Grable, with whom he shares an office with at Linvill. 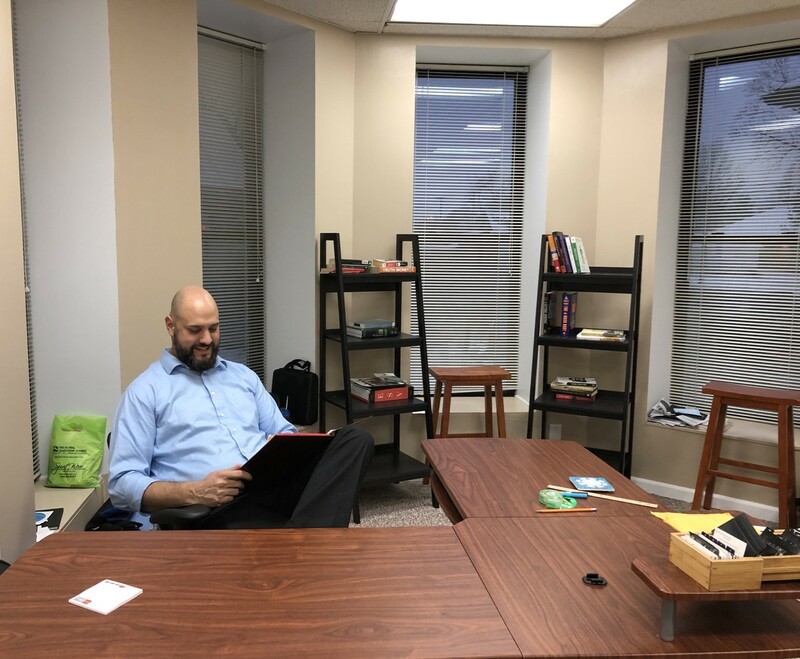 “The guy doesn’t know how to think inside the box — and is so stinkin’ smart.” Among his various entrepreneurial projects, Trent is currently the Director of Indiana Tech’s Center for Creative Collaboration. Nate wants founders to remember three important truths. You can’t be successful in a vacuum. Talk to people. Share ideas. Learn. Talk to everybody. You can learn something from anyone. Accountants, lawyers, your grandma. The world is about connections. Information is plentiful. Connections aren’t.